While the majority of the focus of the Star Wars content at EA Play was on Star Wars Battlefront II, there was another fun announcement about another Star Wars project from Electronic Arts. 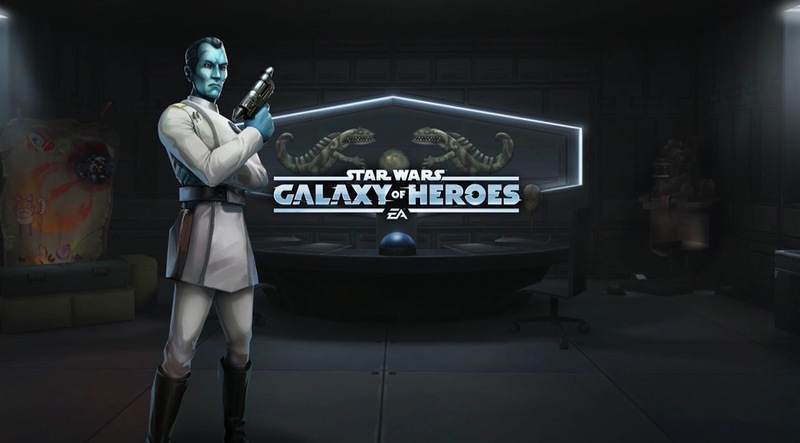 EA announced following the Battlefront II gameplay reveal that Grand Admiral Thrawn would be coming to the mobile game Star Wars: Galaxy of Heroes. The character will be available starting June 15th, and can be acquired by taking your Phoenix Squadron heroes into normal Legendary Events. Grand Admiral Thrawn debuted as the primary antagonist in the novel Star Wars: Heir to the Empire by Timothy Zahn back in 1991. He became one of the most popular characters in the old Expanded Universe (now known as Legends). Following the canon reboot in 2014, Thrawn became the first major character from Legends to be brought into a major new canon project when he was introduced in the Season Three premiere of Star Wars Rebels. Thrawn is set to return this fall in the fourth and final season of Rebels. Star Wars: Galaxy of Heroes was first released back in November 2015 and is available for both Apple and Android devices. The game allows players to collect characters from across the Star Wars galaxy and use them in RPG-style gameplay.